This mens black stripe suit is 60% pure new wool and 40% polyester .This suit has a two button jacket with internal grey lining. 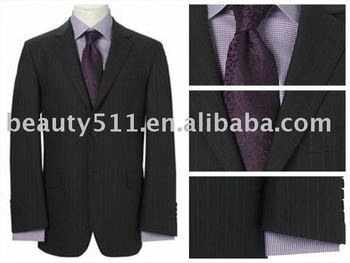 The suit jacket is double vented and suit trousers are flat front trousers with a zip fly. The plain front suit trousers are half lined and have a shirt grip waist band. When selecting your mens suit. Please be aware that the trouser will be 6 inches smaller then the selected chest size. For example; If you order a 42R Suit, the trouser that comes with this would be a 36R.